← Grand-father former pro football players with their grand-sons. Gridiron or not to gridiron? That is the question..
Two opposing religions that have collided violently in the past both support fasting as a means for achieving inner purity of the soul. Fasting probably is the singular common ground between the Jewish people with the Muslim people. What is special about the biology of a body fasting ? Fasting can temporarily stop aging progression. From this ancient practice we must learn more, not only for improving the health of these two adversarial peoples but perhaps to dream one day of fasting harmony occurring as an insight to reduce conflict on our planet. The stakes are high. I will be citing from two very well researched articles. 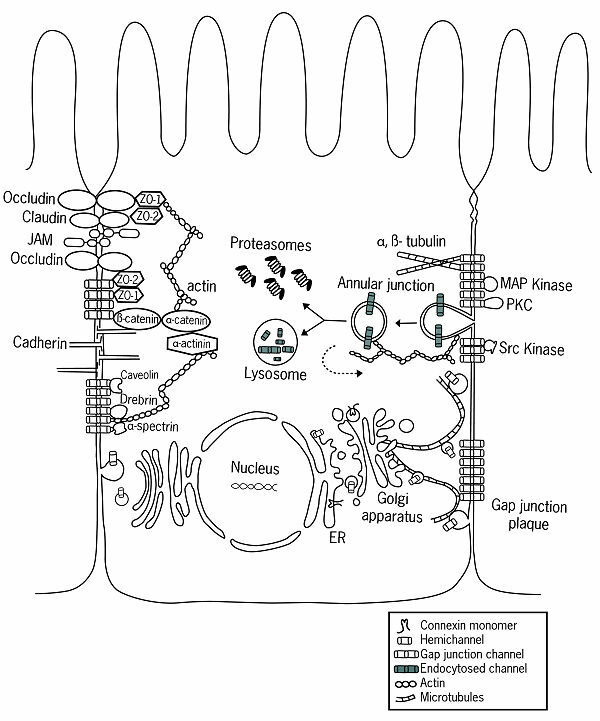 The first article is: Short-chain fatty acids and ketones directly regulate sympathetic nervous system via G protein-coupled receptor 41 (GPR41) by Ikuo Kimura, Daisuke Inoue, Takeshi Maeda, Takafumi Hara, Atsuhiko Ichimura, Satoshi Miyauchi,Makio Kobayashi, Akira Hirasawa and Gozah Tsujimoto/ PNAS May 10, 2011 vol 108, no 19, 8030-8035. The second citation is from frontiers in NEUROSCIENCE REVIEW ARTICLE published March 26, 2012, Vol 6, Article 33, 1-12, authored by David N Ruskin and Susan A Masino, entitled, The Nervous system and metabolic dysregulation: emerging evidence converges on ketogenic diet therapy. Fasting is a survival mechanism. Fasting affects a tipping point of multiple metabolic output systems. Fasting teaches us the link between metabolism and brain function. The body behaving under ketogenic diet restricted conditions, such as starvation and diabetes, produces ketone bodies in the liver and from short chain fatty acids produced in the bacteria of the colon by the fermentation of dietary fiber which contributes a significant proportion of the daily energy as alternate fuels compared to the main metabolic fuel, glucose. Long chain fatty acids are specific agonists for GPR40 and GPR 120 and medium chain fatty acids for GPR84, while short chain fatty acids can activate GPR41 and GPR43. G protein linked receptors are from a large protein family with a transmembrane presence utilizing receptors that ‘sense molecules outside the cell and activate inside signal transduction pathways’ which are ultimately cellular responses. The ligands that bind to activate these receptors include light sensitive compounds, odors, pheromones, hormones and neurotransmitters. Notice the descriptor ‘sense molecules’, which suggest interaction with the shape of molecules outside the shape of ion channels deforming to accommodate binding traffic shape changes, seems to be a lot of tensegrity interactions happening. 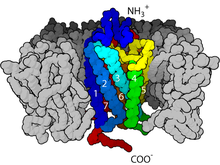 The GPCR are involved in a wide variety of physiological processes including the visual sense, which uses a photoisometrization to translate electromagnetic radiation into cellular signals. The sense of smell, with receptors of the olfactory epithelium binding odorants like rosemary. Behavioral and mood regulation with neurotransmitters, including serotonin, dopamine, GABA and glutamate. Regulation of immune system activity and inflammation:chemokine receptors, like histamine, which bind ligands that mediate intercellular communication between cells to engage target cell types in the inflammatory response of the immune. Autonomic nervous system transmission: both the sympathetic and parasympathetic nervous systems are regulated by GPCR pathways, responsible for control of many of the autonomic functions of the body including blood pressure, heart rate and digestive processes. Sensing cell density, sounds like the compression ability to use tensegrity tension sensing, if you ask my opinion. Finally there is general homeostasis like water balance modulation, which is also shape based changes as water entry swells cell size or exits by shrinking cell size. So as you can see the biblical reference using starvation to stop a seizure is quite ironic for these two fasting people’s both reaching back into the origin of both religions beginnings, sharing the solution to the dropsy disease. The ancient starvation observation that triggers at the tipping point of the entire metabolic brain interface involves, I think, shape sensing GPCR receptors, which is as potent a response as I think there is. Let me introduce connexins into the scheme of things. 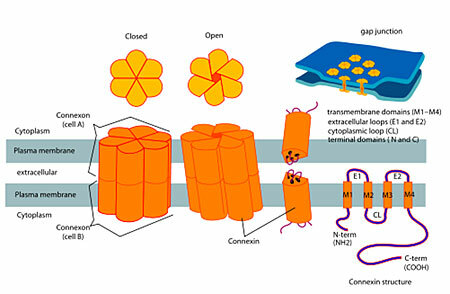 Notice they are described as linking two membranes together as channels in the center can open or close according to the traffic of ions from the outside to the inside. These connexons are not simply like manhole covers acting as drains into somewhere, they are active gate-keepers that move molecules both ways, again I repeat they are not static they move and they sense things. Here’s a scary diagram cartoon of what have been described as gap junctions. I want you to find the actin and microtubules within the drawing, did you find them? Look around the Golgi apparatus and around the occludin. Now I don’t want to frighten you with the detail here but a point should be made never the less. We’re going into lower scales of the actual interaction of two cells in contact yet there are these sketchy actin and microtubular struts. Then if we scale up in terms of size to the connexin cartoon we don’t have the struts but the attachments. Sounds like we’re talking about a coordinated organization of the shape here, no ? Now please forgive me I’m biased but in science we’re all biased although colleagues will scream that they are not it’s impossible we like to think we’re pure and clean in terms of observations but we’re dirty: always have- always will be- it’s our heritage ancient survival thinking that got us here in the first place. Back to the connexin. So here we are scaling in size up then down but there are these attachments and struts, so this is where thinking of the scene in terms of tensegrity may help. It’s not about the bits and pieces it’s about the tension integrity through the entire structure. It’s misleading to see the bits and pieces without thinking of the big picture too so I suggest you think of both scaled views between cells amongst cells. If you were to make a tensegrity bridge here in Montreal to replace the decrepit Champlain bridge what might it look like? Technische University Wien, Usterreich Tensegrity Tube BridgeThe combination of cable-tensioned steel-section compression rings, supported and stabilised by tension-stressed(Kevlar-reinforced) membrane strips running diagonally in two furrows along the outside surface is impressive and logical.The membrane strips, however, are not only a clear constructional component but serve as an “open” roof for the bridge walkway without turning it into a closed tube for the user. The intermittent surface architecture of the bridge fabric provides wind protection and elegant spiralling surface for illumination. It offers the user a wealth of surprising and changing views of what is going on in below, alongside and around the bridge. Walking over the bridge can be a sensuous experience. The jury liked the experience of moving along and through the undulating and dynamic form of the bridge.Here is my point: we have a world apparently constructed with the rule of assembly that satisfy the tenets of tensegrity as the blueprint of the assembly. In our brains as we scale down to the attachments we’re looking at something in the continuum within the structure. The structure has biologically built and replicated itself. Imagine how impressed the jury for the tube composite bridge would be if the bridge moved into position to straddle the river as if it knew what it were doing. Isn’t that what our brain accomplishes every day? As we fast our brains, we are changing shape at critical positions to reduce traffic occurring within the structure dynamically resetting the very baseline. Again I hope you are following along here. As our brain ages we can develop Alzheimer which is this disassembly of the structure. Fasting reconnects the structure, into what looks like, in other words, the bridge can repair itself, now isn’t that a mesmerizing thought? So fasting fixes our brains, it reconnects the structure. awesome! who is the author here?